Its summer and many rock fans will be heading to Las Vegas for a little R&R. With many choices for entertainment, there’s really only one choice for fans of rock and that’s Raiding the Rock Vault. I’ve personally seen the show 3 times and can’t wait to go back. Recently voted the #1 show in Vegas. 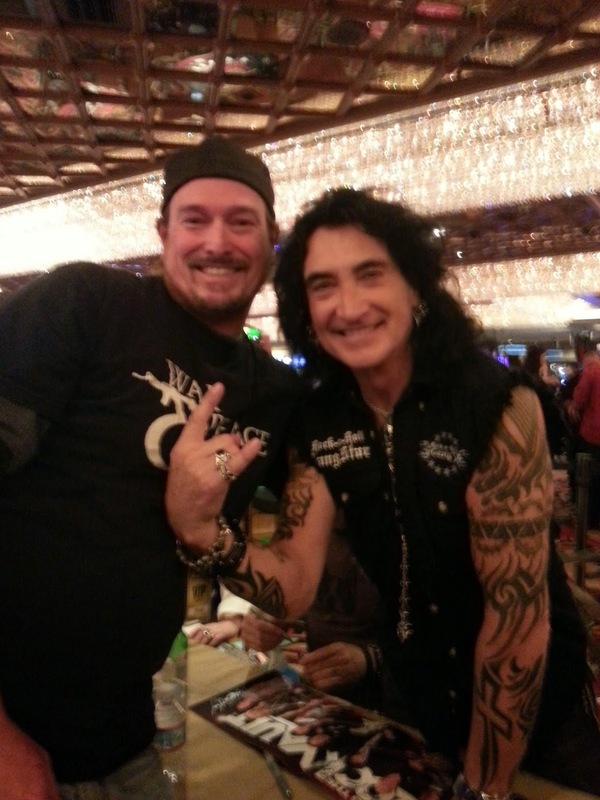 Rock Vault is the brainchild of John Payne (Asia) and producer, David Kershenbaum, the show launched in 2013 and quickly became one of the top rated shows in town. 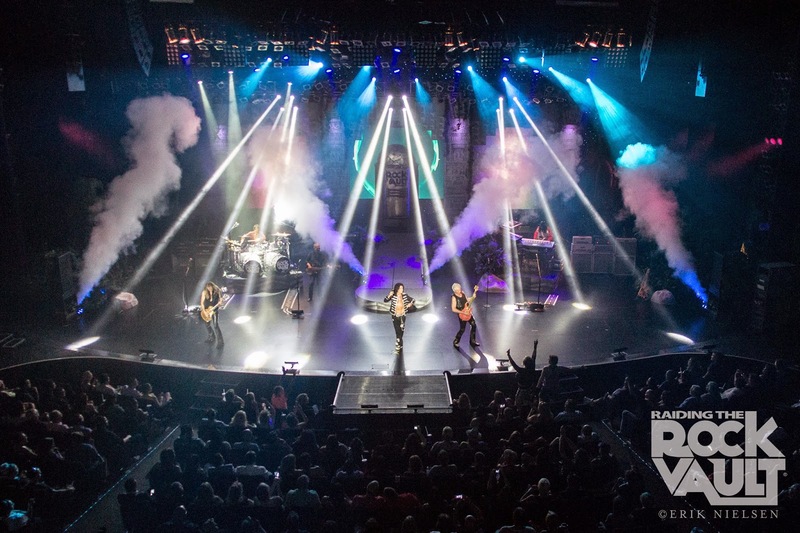 Rock Vault takes the audience on a live chronological journey through the history or rock. Only this is not your ordinary cover band. Posters around town and in the casino advertise “Classic Rock by Those Who Rocked it” and that’s not an understatement or marketing ploy. The talent and pedigrees that makes up this band is just awesome. The two hour show flies by as there is non-stop entertainment. Era-specific mini-skits bridge the musical decades and enable the band to change clothes and take a quick breather. From the opening chords of The Who’s “My Generation” to final bow following Van Halen’s “Jump” complete with a few lucky ladies getting invited to the stage to sing and dance with the band, the energy is awesome. Some of the highlights include Paul Shortino’s cranking out The Doors “Light my Fire” and The Rolling Stones “Honky Tonk Women”, Robin McAuley killing it on Queen’s “We are the Champions” and Led Zeppelin’s Stairway to Heaven” and Doug Aldrich and Howard Leese trading solos on Hotel California. Other songs in the set included,” “Jukebox Hero,” “Smoke On The Water,” “Livin’ On A Prayer,” “Separate Ways,” “All Along The Watchtower,” “Here I Go Again,” “Highway To Hell,” “Alone,” “Addicted To Love,” “Dream On,” “Stayin’ Alive,” and “Another Brick In The Wall,”. It’s obvious the band loves what they do and is truly having a blast. If you are reading this, then you know these names. The musicians that make up this show no doubt wrote and recorded some of your favorite records. Here’s a rundown of the band and just some of their credits. There’s also the occasional special guest. Past special guests have included, Bobby Kimball, Joe Lynn Turner, Jon Anderson, and Lou Gramm. A VIP option is available which gives you a chance to go backstage for a meet and greet with the band prior to the show. The guys will even hangout after for autographs and photos with the audience. As of the writing of this review, the band released a second volume of studio versions of some of the songs from the show. Songs from Raiding the Rock Vault volumes one and now two are available at the show and digitally through iTunes and Amazon.com.